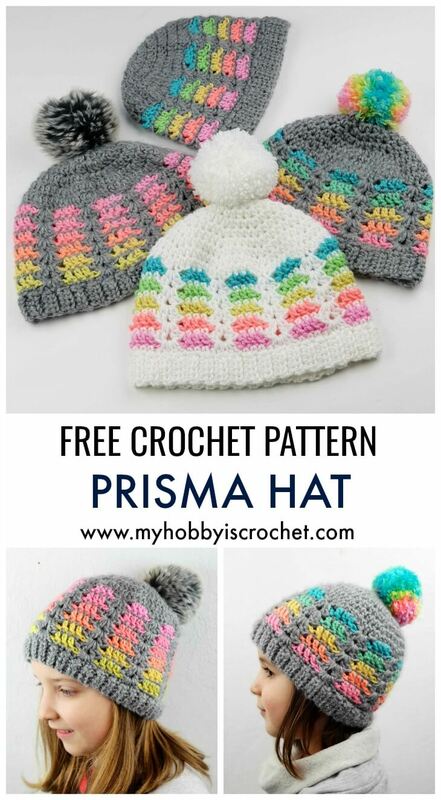 If you love crocheting top down hats, the cheerful Prisma Hat is just what you're looking for! It looks beautiful in rainbow colors, but you can use the colors of your choice and combine them as you wish. Part of the yarns was provided by Red Heart Yarns. Crochet Hook provided by Furls Crochet. The look of this hat reminded me of an optical prism that spreads white light into the colors of the rainbow. This is how the name of this hat pattern was born. Because Prisma means prism in many languages, such as German, Romanian, Italian and Spanish. This beanie works up pretty quick, only the knit-look crochet cuff requires a bit more time, but it is so worth it! I think it looks really pretty! You'll work the hat top down in rounds until the cuff; then the cuff will be crocheted in rows directly into the hat edge. To embelish the hat you can use a ready made faux fur pom pom, or you can make your own faux fur pom pom or yarn pom pom. Please use my affiliate links to buy your supplies online! Thank you! 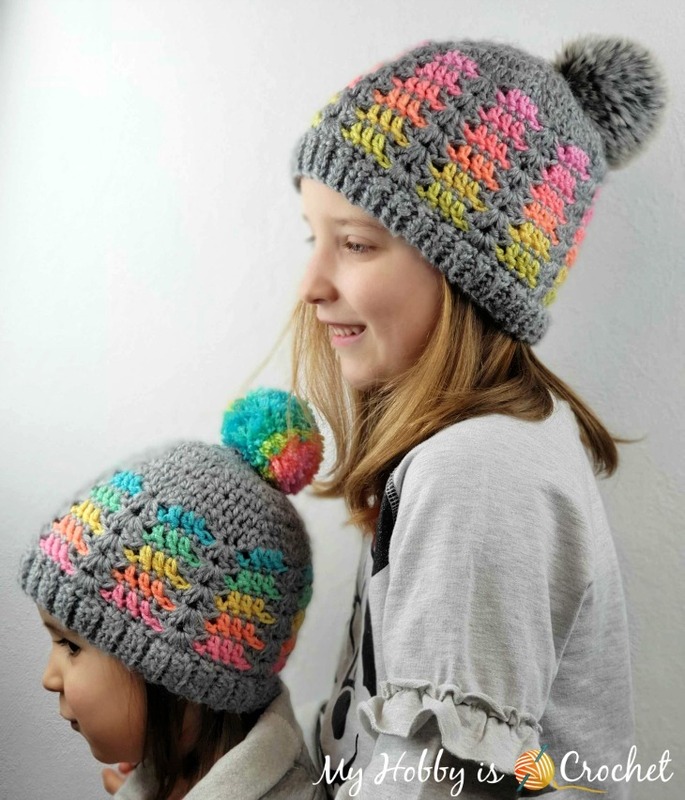 - 2 sizes (3-5 year child and adult women) using a 5.5 mm hook and hdc increases for the crown of the hat. 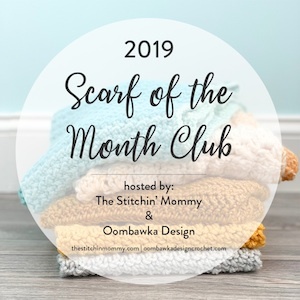 For a perfect seamless look it was used a special joining into round - The invisible Join, while the rounds are started with standing stitches - See this Video Tutorial from Yay for Yarn on YouTube! Using the current color, join into round with sl st to first st. Pick up the new color and pull it through the loop on the hook. Tug the previous color tight. Start the new round with the new color making standing sts, as seen in the video linked above. With hook size 5.5 mm and yarn color A make a magic ring. Stop here with increases for small child size! Round 9: Ch1, *2 hdc in first st, 1 hdc in each of next 7 sts, rep from * around, sl st to top of first hdc. (72 sts total). If you would like a visual help for the stitch pattern used for the sides of the hat, you can check out the Step by Step Tutorial in my Dreamy Christmas Stocking that uses the same stitch. Round 1: work 1 standing dc into first st, 1dc into next st, *ch 5, sk next 5 st, work 1 dc into each of next 3 sts; rep from * to last 6 sts, ch5, sk next 5 sts, ending the round with 1 dc into last st; invisible join with sl st to top of standing dc. For small child size you’ll have 8 blocks of 3dc and 8 ch5 arches. For teen/small adult you’ll have 9 blocks of 3dc and 9 ch5 arches. Round 2: change to A, ch1, work 1 sc in same st, 1 sc into next dc, *work 1 shell into the 3rd. from the 5 skipped hdc 2 rounds below, work 1 sc into each of next 3 dc; rep from * to last ch5 arch, work 1 shell into the 3rd. from the last 5 skipped hdc 2 rounds below, ending the round with 1 sc into last dc of previous round, invisible join with sl st to top of first sc. (8 shells made for small child size/ 9 shell for adult). Round 3: change to B, work 1 standing dc into first sc, 1 dc into next sc, *ch 5, sk next shell, work 1 dc into each of next 3 sc; rep from * to last shell, ch 5, sk last shell, 1 dc into last sc, invisible join with sl st to top of standing dc. Round 4: change to A, ch1, 1 sc in same st, 1 sc in next dc, *work 1 shell into ch 1 space of next shell 2 rounds below, 1 sc in each of next 3 dc*, rep from * to last ch 5 arch, 1 shell into ch1 sp of last shell 2 rounds below, 1 sc into last dc, invisible join with sl st to top of first sc. Rounds 5-8: Rep as rounds 3 - 4, ending with a round 3 (with color B) repeat. Ch1, sc in same st, 1 sc in next dc, *(1 dc, 1hdc, 1sc, 1hdc, 1dc) into chsp of shell 2 rounds below, 1 sc in each of next 3 dc*, rep from * to last ch 5 arch, work (1 dc, 1hdc, 1sc, 1hdc, 1dc) into ch1 sp of last shell 2 rounds below, 1 sc into last dc, invisible join with sl st to top of first sc. You should have 5 shell rounds for both small child and adult sizes! Continue working with A the ribbing around the edge of the hat! For the ribbing I have alternated 1 row of slip stitches worked into the back loops only with 1 row of half double crochet worked into the back loops only. This combination has created a knit-look stretchy crochet ribbing. Change to hook size 5 mm! Repeat as rows 2-3 around the hat edge, untill you have just 1 st left on the edge. Sl st into last st on edge and slst to join to first st on edge. Cut yarn, finish off. Turn the hat inside out and sew (or crochet) the sides of ribbing together. Weave in all ends. You should have a number of ribs that is the half of the total sts had for the sides of the hat. For example: 3-5 years child for 64 sts around, you’ll have 32 ribs, for teen/adult 72 sts around = 36 ribs. With hook size 5 mm and yarn color A make a magic ring. Join all next rounds with invisible join! Continue with hook size 5 mm the sides without increases the same as written above for the adult size, making 6 rounds of shells. Work the Ribbing the same as for the other sizes. You’ll have 36 ribs around. 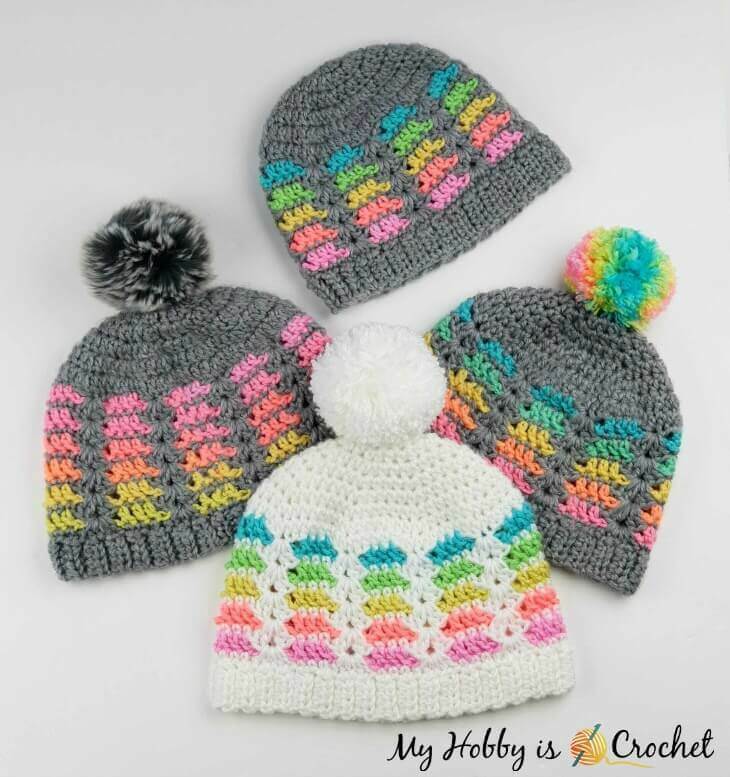 You can either make your own yarn pom pom using a cardboard or a pom pom maker, such as Clover Pom Pom Maker; or you can add a beautiful, removable Faux Fur Pom Pom with press buttons. I hope you enjoy this pattern! For more free crochet patterns and tutorials, please visit my FREE Crochet Pattern Page! Many thanks to Red Heart Yarns for providing the Retro Stripe yarn used for this pattern!